A fuel injector is a fuel injector. They're all the same, right? Well, not so much. There are actually many different methods to make the combustion process possible, but two are perhaps the most popular: unit injectors and common rail injectors. Both of these types of fuel systems have been around in some form or another for years. Unit injectors in particular have been a popular choice for diesel engines for decades. While early designs of common rail injection systems have been around for nearly as long, it's not been until recently that they've started to grow in popularity. This is driven in part by new emission standards that common rail injectors can meet much more easily than other injector types. While their primary function is the same—to inject fuel into the cylinder during the combustion process—these system types operate quite differently and likewise the injectors themselves are made up of different parts. Below, we'll take a look at the different features and problems of both systems. With unit injectors (also commonly referred to as "pump nozzles"), each injector operates independently, relying on the camshaft for proper timing. 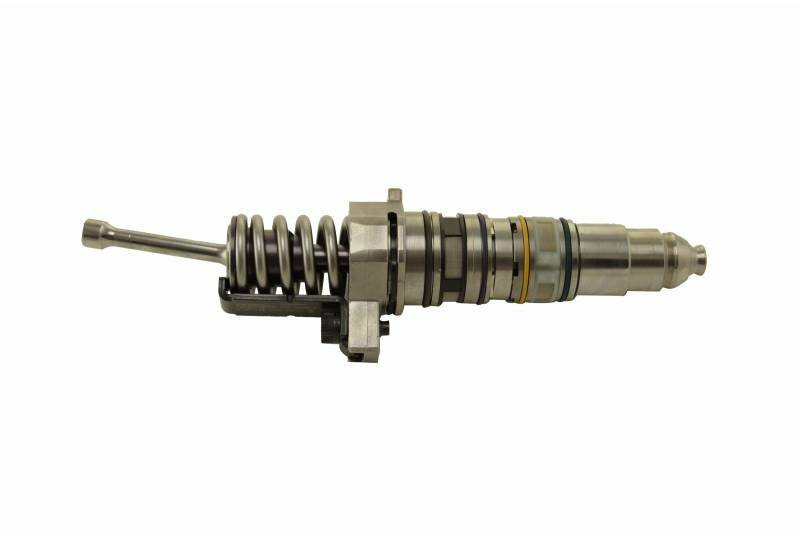 The injector and the pump are a single component, allowing for the fuel pressure to be maintained within the injector itself before being sprayed into the cylinder for combustion. Because of its reliance on the camshaft, this system doesn't have the same level of flexibility as other injection types, where timing is controlled by the ECM. Unit injectors have been both electronic and mechanical, depending on the engine type. Because the injectors are both injector and pump in one part, the individual components themselves are slightly more complicated. In a unit injector system, the fuel is not kept at a constant high pressure before entering the injectors. Rather, it is at a much lower pressure while moving through the engine. It is the injectors themselves that pressurize the fuel to a much higher degree before every injection, due to their dual capacity as injectors and pumps. Unit injectors use smaller amounts of fuel in the beginning of the process, resulting in a high efficiency engine with lower soot and emission levels than could be achieved by other injection systems (excepting perhaps the common rail system). But because of the growing popularity of the common rail system, some reason that it's unlikely we'll see many changes or improvements to the design and function of unit injectors in the future. Common rail injectors utilize a high-pressure fuel rail that provides fuel to the individual injectors. Unlike with unit injectors, the rail maintains the fuel at a constant, high pressure that is necessary for injection. The injectors don't change the pressure of the fuel themselves, as it's ready for injection when it’s drawn into the injector. Because of this, the pump is a separate component, rather than a part of the injector itself. The injector itself is then a bit of a simpler design than the unit injector. The injectors in a common rail system are, for the most part, electronic, utilizing solenoids and relying on the ECM to control their timing. With this system, a small amount of fuel is injected into the cylinder before the full injection to optimize timing and fuel quantity. This helps to make the engine more fuel efficient overall. You'll also be getting more power as a result, while decreasing the amount of noise and vibrations produced by the engine. The higher pressure capabilities also allow for increased efficiency and improved emissions. Some even point out that the full possibilities for this technology haven't yet been realized, leading to likelihood of even further improvements being made to the overall design and function in the future, especially as regulations continue to change. While the common rail injector system has been in production for much less time than other injection types, it has grown in popularity, and that doesn't seem to be slowing down. It does, however, bring with it its own unique set of problems. It is more complex a system as a whole, which can lead to a higher price tag when it comes to replacing components. Because it maintains fuel at a higher pressure for longer, more components are affected by that pressure. This can result in an increased risk of damage to other components. It is very sensitive to contaminants, more so than other injector types. In fact, one of the leading causes of failure in common rail systems is fuel contamination, yet it is one of the most frequently overlooked. If you notice a decrease in fuel economy and think it might be due to a problem with your common rail fuel injectors, you might want to have your fuel quality tested. In the end, your fuel injection type is decided by the type of engine you have, and you're limited by the modifications made to that engine and its components. It's good to know what fuel system it is, though, to help ensure you're getting the proper parts for it. If you're buying a new engine, this is an important consideration to take into account, because while a unit injector engine might be less expensive up front, it might end up costing you more as components stop evolving and become harder to find. A common rail injector engine, on the other hand, will cost you more, however it will save you money at the pump, and improvements are being developed all the time. Got injector questions? We've got answers! Call us at 844-215-3406 to speak with one of our certified sales techs! Low on time? You can also request a quote online.